Volumes 36 and 37 of the Gabriel Wells Definitive Edition of Mark Twain's works are two volumes of Mark Twain's Autobiography edited by Albert Bigelow Paine, Clemens's official biographer and later his literary executor. Paine and Clemens first met in 1901. In December 1905 Paine attended Clemens's 70th birthday party hosted by Harper and Brothers. By January 1906 he had developed a relationship with Clemens that firmly establish his position within the Clemens household with complete access to Clemens's papers, business dealings and correspondence. 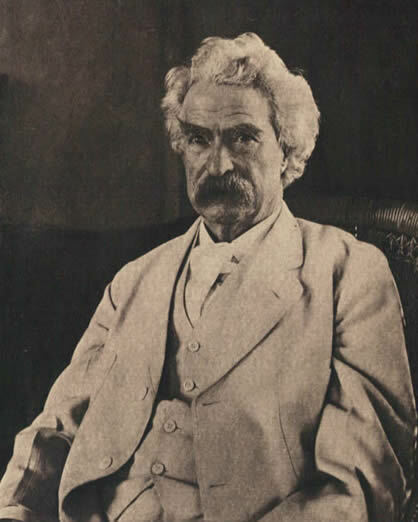 In 1912 Paine wrote a multi-volume edition of Mark Twain: A Biography which was followed in 1917 by a two-volume edition of Mark Twain's Letters which Paine edited. In October 1924 Harper and Brothers copyrighted and published the first edition of the two-volume edition of Mark Twain's Autobiography edited by Paine. The volumes contain about 195,000 words including material previously published in both the North American Review during Clemens's lifetime as well as material Paine had submitted for publication in Harper's Magazine in 1922. Known among scholars as "Paine's edition" of Mark Twain's Autobiography, the material was carefully selected and discreetly edited to protect Clemens's public image and represents only a fraction of Mark Twain's autobiographical writings and dictation. In 1925 Paine's Mark Twain's Autobiography was included as Volumes 36 and 37 in the Gabriel Wells Definitive Edition of Mark Twain's works. In keeping the numbers of full-page portraits and illustrations consistent with the numbers included in previous volumes, the Gabriel Wells edition of Mark Twain's Autobiography contains additional photographs not included in the 1924 first edition. (The first edition issued by Harper and Brothers contained one photographic frontispiece per volume.) 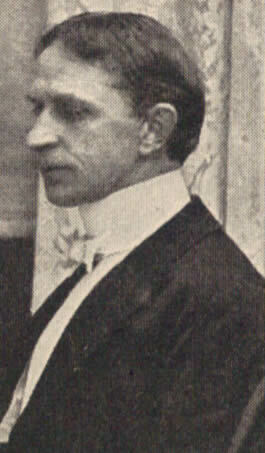 Among the additional photographs included in the Gabriel Wells edition is the last know formal photograph for which Clemens sat prior to his death. Albert Bigelow Paine (b. 1861 - d. 1937) in a candid photo from Mark Twain's 70th birthday party, December 1905. MARK TWAIN had been a celebrity for a good many years before he could be persuaded to regard himself as anything more than an accident, a news-writer to whom distinction had come as a matter of good fortune rather than as a tribute to genius. Sooner or later his "vein" would be worked out, when he would of necessity embark in other pursuits. But a year later, when the publication by his firm of the Memoirs of Gen. U. S. Grant brought him into daily association with the dying conqueror, the thought came that the story of this episode might be worthy of preservation. It was not, for the present, at least, to be an autobiography, but no more than a few chapters, built around a great historic figure. General Grant's own difficulties in setting down his memories suggested prompt action. Mark Twain's former lecture agent, James Redpath, was visiting him at this time, and with a knowledge of shorthand became his amanuensis. The work they did together was considerable, covering in detail the story of the Grant publishing venture. Clemens may have planned other chapters of a personal sort, but, unaccustomed to dictation, he found the work tedious, with a result, as it seemed to him, unsatisfactory. A number of important things happened to Mark Twain during the next dozen years, among them his business failure, which left him with a load of debt, dependent entirely upon authorship and the lecture platform for rehabilitation and support. The story of his splendid victory, the payment to the last dollar of his indebtedness, has been widely told. He was in Vienna when he completed this triumph, and, whatever he had been before, he was now unquestionably a world figure with a recognized place in history. Realization of this may have prompted him to begin, during those busy Vienna winters (1897 to 1899)) something in the nature of an autobiography, recollections of his Missouri childhood, a picture as primitive and far removed from to-day as anything of the Colonial period. These chapters were handwritten, his memory was fresh and eager, and in none of his work is there greater charm. As he proceeded he did not confine himself to his earlier years, but traveled back and forth, setting down whatever was in his mind at the moment. He worked incidentally at this record for two or three years, eventually laying it aside for more immediate things. Five years later, in Florence, where he had taken Mrs. Clemens for her health, he again applied himself to what he now definitely termed his "Autobiography." As in that earlier day, he dictated, and this time found it quite to his liking. He completed some random memories of more or less importance, and might have carried the work further but for his wife's rapidly failing health. Her death and his return to America followed, and there was an interval of another two years before the autobiographical chapters were again resumed. It was in January, 1906, that the present writer became associated with Mark Twain as his biographer. Elsewhere I have told of that arrangement and may omit most of the story here. It had been agreed that I should bring a stenographer, to whom he would dictate notes for my use, but a subsequent inspiration prompted him to suggest that he might in this way continue his autobiography, from which I would be at liberty to draw material for my own undertaking. We began with this understanding, and during two hours of the forenoon, on several days of each week, he talked pretty steadily to a select audience of two, wandering up and down the years as inclination led him, relating in his inimitable way incidents, episodes, conclusions, whatever the moment presented to his fancy. It was his custom to stay in bed until noon, and he remained there during most of the earlier dictations, clad in a handsome dressing-gown, propped against great snowy pillows. He loved this loose luxury and ease and found it conducive to thought. On a little table beside him, where lay his cigars, papers, pipes, and various knickknacks, shone a reading lamp, making more brilliant his rich coloring and the gleam of his shining hair. There was daylight, too, but it was north light and the winter days were dull, the walls of the room a deep, unreflecting red. His bed was a vast carved antique affair, its outlines blending into the luxuriant background. The whole, focusing to the striking central figure, made a picture of classic value. Start at no particular time of your life; wander at your free will all over your life; talk only about the things which interest you for the moment; drop it the moment its interest threatens to pale, and turn your talk upon the new and more interesting thing that has intruded itself into your mind meantime. Certainly there is something to be said in favor of his plan, and I often thought it the best plan for his kind of autobiography, which was really not autobiography at all, in the meaning generally conveyed by that term, but a series of entertaining stories and opinions -- dinner-table talks, in fact, such as he had always delivered in his own home and elsewhere, and with about the same latitude and elaboration. "When I was younger I could remember anything, whether it happened or not; but I am getting old and soon I shall remember only the latter." "It isn't so astonishing the things that I can remember, as the number of things I can remember that aren't so." Perhaps if is proper to assure the reader that positive mistakes of date and occurrence have been corrected, while, for the rest, the matter of mere detail is of less importance than that the charm of the telling should remain undisturbed. Our work, begun in the New York house at 21 Fifth Avenue, continued with considerable regularity during a period of about two years, and intermittently during another two. When the first spring came it was transferred to the Upton House, on the slopes of Monadnock, near Dublin, New Hampshire, a perfect setting for the dictations. He no longer remained in bed, but, clad in creamy-white flannels and loose morocco slippers, bareheaded, he paced up and down the long veranda against a background of far-lying forest and distant hill. As I think of that time, now, I can still hear the ceaseless slippered, shuffling walk, and see the white figure, with its rocking, rolling movement, that preternaturally beautiful landscape behind it, and hear his deliberate speech -- always deliberate except at rare intervals; always impressive, whatever the subject might be. In September we returned to the New York house and the work was continued there, that winter and the next. It reached its conclusion at Stormfield, the new home which he had built at Redding, Connecticut, and it was here that he died, April 21, 1910. In the beginning it was Mark Twain's frequently expressed command that the "Autobiography" was not to be published until he had been dead at least a hundred years. But as the months passed he modified this idea, and himself selected a number of chapters for use in the North American Review. Discussing the matter later, he expressed a willingness that any portions of the work not dealing too savagely with living persons or their immediate descendants should be published sooner, either serially or in book form. The manuscript in time became very large and very inclusive. He even incorporated in it articles and stories which he had written and laid aside, among them "Captain Stormfield's Visit to Heaven." "Is Shakespeare Dead?" was originally a part of the "Autobiography," but he published it separately in a small volume. "The Death of Jean," written (not dictated) immediately following that tragic event, was to be the closing chapter, and such in time it will become. He wished, however, that it should have separate publication and it is for the present included in another volume. It was his last complete writing of any sort, and in all his work from beginning to end there is nothing more perfect -- nothing more beautiful. * Most of Mark Twain's work up to this time, Roughing It, Tom Sawyer, Life on the Mississippi, etc., had been of an autobiographical nature. Also, as early as 1870 he had jotted down an occasional reminiscent chapter, for possible publication, though apparently with no idea of a continuous narrative. Such of these chapters as have survived are included in Vol. I of the present work. -- A. B. P.
Rasmussen, R. Kent. Critical Companion to Mark Twain: A Literary Reference to His Life and Work, Volumes 1 and 2. (Facts on File, 2007).